Would you like to have a whiter, brighter smile? Do you want professional results, but not the high prices that come with professional teeth cleaning services? Me Too! I have to admit, my teeth are not the whitest. I brush every day with a whitening toothpaste, but I also drink coffee every morning, and a couple of soda’s throughout the day. I have been contemplating getting them whitened for some time as I do feel a little self conscious about the color. They are not horrible, but I feel they could be whiter. 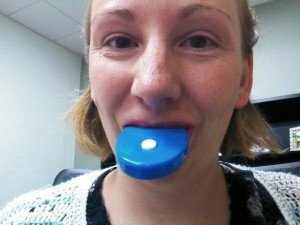 So when I was offered the chance to try the Smile Brilliant teeth whitening system, I thought it was the perfect opportunity to get my teeth a little whiter! Smile Brilliant is a national dental lab designed to help their customers receive professional strength teeth whitening without ever visiting a dentist. Smile Brilliant offers lab-direct professional strength bleaching gel right to you–the same that you would get from your dentist and without the high cost of a dental visit. You brighten your teeth in the comfort of your own home. I received the Brilliantly Simple package to test out. When you don’t have time to mess with syringes and need immediate results on the go, Brilliantly Simple does it all. Smilebrilliant.com is pleased to offer a tooth bleaching package that generates results in an easy to carry package. In as little as 20 minutes per day, Brilliantly Simple gets results and goes where you go. 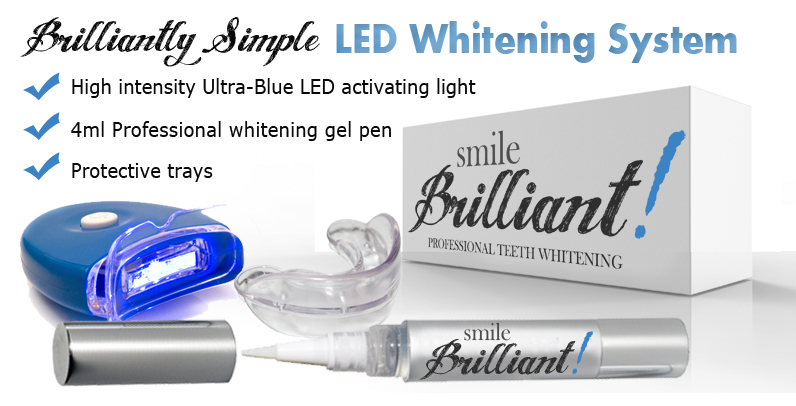 The whitening system includes an ultra high strength professional whitening pen with an LED lighting system. The gel paints on quickly and the LED whitening light accelerates the process. Affordability on the go is Brilliantly Simple! With this package, grab the pen, accelerate with the LED light, and GO! Everything you need. 20 minutes a day. Guaranteed results or your money back! When I first got the kit in the mail I was really excited, I couldn’t wait to start using it and getting some of the yellow color out of my teeth. I wasn’t able to use it right away though, it took about a week for me to find time to build using the kit into my routine. Twenty minutes probably isn’t a lot of time to most people, but for someone like me who has a lot on her plate, twenty minutes is precious. Finally I was able to work out where I could use it with the LED light for the first part of my shower, and then when I would get to washing my face, I would remove the LED light and just use the tray. My showers are typically about 10-15 minutes long, so I only had to use it for about another five minutes after I got out, which was pretty simple to do. The kit itself is really easy to use. You simply take the gel pen and “paint” it onto your teeth with the enclosed paint brush. You put the tray in your mouth, and put the LED accelerator in. Wait 20-40 minutes and you are done! 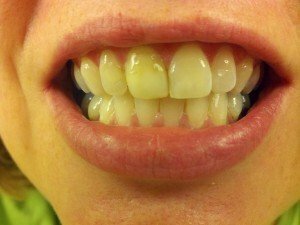 I have some pictures to share to show my teeth before and after about a week of use. It is recommended that you use it for at least two weeks to see best results. I plan on continuing to use it for at least another week! Want to try this kit for yourself? Enter coupon code smilemaintenance for 15% off! We will be giving away one of these very same kits to one lucky reader! If you want to try to get whiter teeth of your own, come back to visit us on Monday July 9th and enter to win in our Summer Fun Giveaway Hop! Why Letting My Kids Fall Asleep In My Bed Has Made Us A Happy Family!